This day is widely observed as the appearance anniversary of Jesus Christ. "Regarding the Christmas Day meal with your family, I do not think you should partake of the food prepared by non-devotees. Better you should prepare your own foodstuffs and offer to Krishna and then, if you like, you may offer these remnants to Lord Jesus. I think that Lord Jesus will also appreciate this. Of course you may sit down with your family and take fruits and milk which they offer but rather than taking the foods which they have prepared, you may prepare and offer your own prasadam for Lord Krishna, and then offer the same to Lord Jesus." 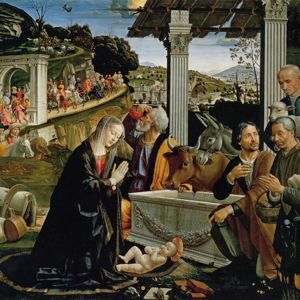 Pictured is Adorazione Dei Pastori by Domenico Ghirlandaio.